For over three hundred years coffee plays an important role in the life of every Viennese. Just like for us Italians, in the Austrian capital coffee is part of the culture and sets the rhythms of the day, but – while in Italy most of the time its consummation means two gulps standing at the bar – such rushing attitude has nothing to do with the concept of taking coffee in a kaffeehaus in Vienna where it becomes a ritual, a state of mind, a way of life. After being invited to sit back, maybe on a cozy sofa, no matter what you have chosen from the more than 20 types that usually fill the menu, your coffee will be served on a silver tray, accompanied by a cup of water on the edges which the teaspoon sugar finds its balance. While you sip you can read the newspaper – probably in your language -, knitting, writing a book, chat with a friend or look out the window for hours, even after emptying the cup: never ever get the feeling that both time to vacate the table. During the week I spent in Vienna, choosing the cafeteria where to have breakfast has quickly become a pleasant habit: a tour at the end of which I have decreed a melange like my favorite one, among the various types of coffees. Historical premises, often very elegant, they have on centuries of coffee served, many of today kaffeehaus Vienna are the result of a metamorphosis occurred over time: some, in addition to coffee and pastry products, serve food from starred restaurant, have expanded menu variations accepting less indigenous coffee – such as latte and cappuccino – and offer free internet access. But there is still a lot of poetry that surrounds the ancient Viennese kaffeehaus probably depends on whether you have always been much more than a place where you just have a coffee, since the opening of the first in 1685, exactly two years after the Turks left whole bags of coffee beans after the failed attempt to besiege the city. Over the centuries the kaffeehaus Vienna strengthened its role within the company becoming the place where artists, writers, architects and other intellectuals worked, discussed, chiocavano chess, read the newspaper, many of whom spent so much time in cafe there to receive private calls and mail. Often, all before the same Einspänner or melange, who sipped for hours and hours. From coffee lover, keffehaus Vienna have made signed a happy person. During my stay I preferred to stop in the older ones to keep the atmosphere of imperial Vienna, but in the city there are many others – there are more than a thousand – and modern: new clubs and trendy where however the coffee culture is still tied to tradition. The marble columns, vaulted ceilings and decorated two enormous paintings depicting, respectively, the Emperor Franz Joseph and Empress Sissi make the Café Central one of the cafes of Vienna’s most elegant and famous. At the beginning of the 20th century, this wiener kaffeehaus was a popular meeting point for a long list of artists and thinkers, which included names of the caliber of Sigmund Freud , Oskar Kokoschka , Adolf Loos and Hugo von Hofmannsthal . If the idea is to have breakfast, best to arrive no later than 9: arriving at that hour and agreeing to share a table with another couple, we were seated fairly quickly. When we left, the front door was a row that completely invaded the sidewalk. 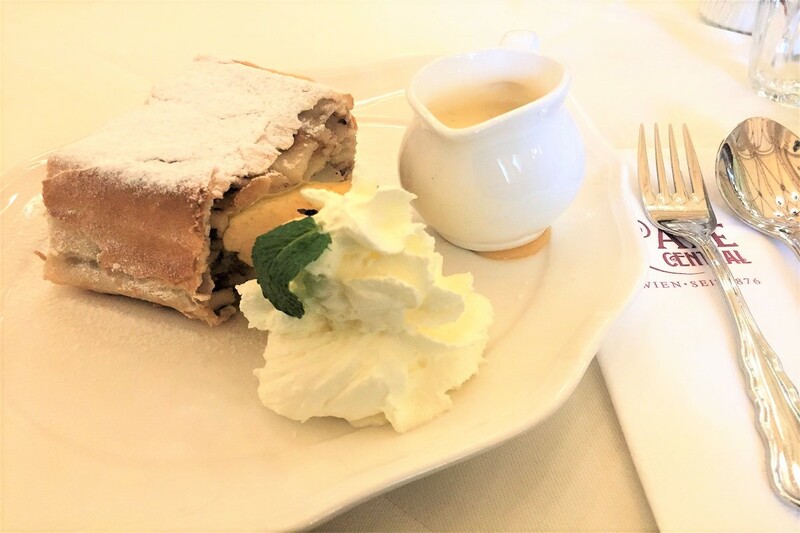 The menu offers a wide selection for both lunch and dinner and desserts – all homemade – are good: apple strudel with warm custard cream has won my heart. At the corner of Herrengasse and Strauchgasse. From Monday to Saturday: 7:30 to 22:00. Sunday and holidays: 10:00 to 22:00. A pianist performs every day from 17:00 until closing. The first thing that must be said is that the Griensteidl enjoys an almost perfect location: looking out on Michaelerplatz, if you are lucky enough to occupy one of the tables to the left of the bar, you can sip your coffee with a beautiful view of the imperial complex Hofburg. Since 1847 and for fifty years to follow Griensteidl was one of the most popular local bohemians of Vienna, boasting among customers artists, writers and journalists, until the reconstruction of the square in front of the project does not ordered the demolition and much of customers moved to the nearby Café Central. In 1990 Griensteidl reopened inserting furnishing sofas and chairs with red upholstery and dressing tables from lines Belle Epoque, recreating the vintage of the century atmosphere. Every day from 8.00 to 23.30. It is probably the most touristy of kaffeehaus Vienna where I was, but at the same time – with its red and white decor, large crystal chandeliers and staff from the perfect livery – represents the quintessential imperial Viennese elegance. Just go no later than 9 to avoid the long line of tourists who regularly shaped entrance and pay attention to cross the entrance of the Café Sacher and not the nearby Sacher Stube – but opens at 10 – which is just as stylish and serves the same food, but does not offer the same intimate atmosphere. I think it’s useless to suggest to accompany the coffee with a slice of Sachertorte: I can not prove that it is indeed the best in the world – it’s certainly the most delicious I have eaten – but at least it is prepared according to the original recipe of 1832 that, as it is said, it seems to be still secret. Every day from 8:00 to midnight. The Diglas family became the protagonist of the Viennese culinary scene at the end of the 800, when he could boast to delight the palate of the Emperor Franz Joseph in its Türkenschanzpark restaurant. Entering at Cafe Diglas therefore equivalent to cross the door of one of the best pastry chef of the whole Vienna. The red leather chairs, white marble tables and the beautiful black and white elegant women of the early twentieth century decor complete a fairly modest, especially when compared with that of other traditional kaffeehaus, but the whole thing makes the atmosphere very authentic that takes us directly to the 20’s. The local specialty is Heiterschaufen , a bread pudding covered with a thick layer of meringue and immersed in vanillasoße, or a dense bed custard. Every day from 8.00 to 22.30. A pianist performs in the evening on Tuesdays, Wednesdays, Fridays and Saturdays.